People are always looking for ways to save money, and by eating out less and cooking at home more, you’ll be able to do just that. However, before you go to the grocery store and just start randomly putting food in your basket, you’ll want to get organized first. Keeping the following tips in mind will give you noticeable savings at the register, while helping to maximize your spending. Always make a list before you go shopping. Planning out your menu a couple of weeks in advance will help you decide what you should buy, and save you on making multiple trips to the grocery store. To help you decide what you’ll need, keep a running tally on your refrigerator throughout the week so you remember what you are running low on, but always double check your cupboards before you leave for the store so you don’t buy something you already have plenty of. 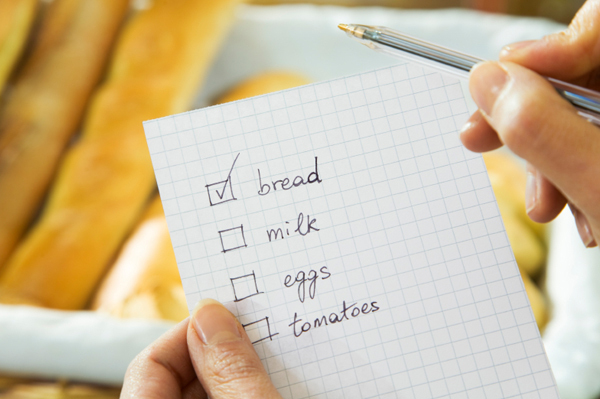 You can print this blank grocery list — or use this grocery checklist list for a head start! When you shop while hungry, everything looks good to you, and you’re more likely to buy something you don’t need or that isn’t good for you. Shopping on a full stomach will help you skip the cookie aisle and keep you focused on your list. This can save you money, but only if you use all of what you purchase before it goes bad. Obviously paper products will last, but if you’re buying food products en masse, make sure you will be able to fix it all before it spoils, or else you will just be throwing money away and wasting food. You don’t have to completely cut meat out of your diet, but since it’s expensive, buying less meat at the grocery store will also save you some money. Plan one or two vegetarian meals a week, such as pasta, chili or salads. You’ll notice a significant savings. Go into the grocery store with a set limit you can spend. If you don’t know what your budget is, you’ll almost always spend too much, so look at your finances and decide what your limit is for food. 7. Enough for an army? You buy in bulk, so why not cook in bulk? Cook more than your family will eat and freeze the rest or eat it the next day as leftovers. This will not only stretch out your food supplies for the week, but will also save you from having to cook the next day. One of the best ways to save money is to purchase items when they are discounted. Using coupons will add up at the register, but only use them for things that you need. Don’t buy something just because you have a coupon. Also trying the store’s brand versus a name brand, which will save you some bucks. If you don’t like it, don’t buy it again, but you might just find you like the no-name brand just as much as the premium one. It’ll save a few dollars. Lastly, keep an eye out for store specials. Again, don’t buy something just because it’s on sale, but if you need it, take advantage of the two-for-one specials.